We are always thriving to get the most we can out of our iOS devices and discover as many shortcuts as possible. When your messaging someone via the stock messages app, you’ll have to manually tap on ‘Contact’ button located right at the top of the conversation in order to call or facetime the person. Wouldn’t it be much easier if you could just raise your phone near your face and it would automatically call the person? This is what makes a new jailbreak tweak called RaiseToCall2 so special. 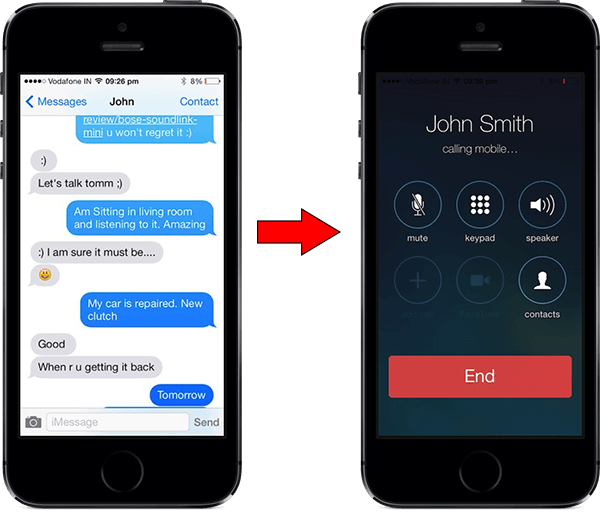 As you might have guessed, RaiseToCall2 is a jailbreak tweak that allows you to automatically call the person you’re messaging to just by raising your device to your ear. It automatically starts calling the person you were messaging with. The tweak uses the device’s front proximity sensor in order to detect the distance. When the device is near your face or ear, a phone call is made to the recipient. Regarding battery issues, the effect of the tweak on the battery level hasn’t been tested but since it uses the proximity sensor and it has to be enabled always in order to detect the distance, it might drain your battery. Once you install the tweak, no configuration is required to make. All you have to do is to open the message application, go to a conversation and raise the device near your face or ear to initiate a phone call. One drawback to this tweak is that only phone calls can be made, this means that you can’t make a factime call when you raise the device near to your face. So this tweak is definitely made for an iPhone only. If you’re interested in RaseToCall2 jailbreak tweak, you can grab it from Cydia via BigBoss repository for $1.99.